The venous cutdown is a procedure where a vein is surgically exposed to establish a vascular access by inserting a cannula or catheter. It is mostly done in an emergency when there is no peripheral vein is available for putting a cannula for vascular access or in cases of trauma and hypovolemic shock patients when enough peripheral cannulation is not present to locate the vein. Intravenous (IV) access is a crucial step in the resuscitation of any critically ill or injured patient. Though central venous lines have replaced this technique for establishing vascular access, it remains an excellent alternative when other approaches have failed or the physician is not able to use the central line for some reason. In infants and children, however, cutdown has largely been replaced by intraosseous access and is only recommended when all other methods have failed. The great saphenous vein is the vessel most commonly used for the venous cutdown, followed by basilic vein. The ankle is the most common site for this procedure because of the predictable and superficial location of the vein in this area. Saphenous vein at the groin is another site. Keeley in 1940 introduced this technique as an alternative to venipuncture in patients with shock. Venous cutdown allows for large-bore access and the rapid infusions required in the critically ill trauma or medical patient with difficult access. It is indicated for the purpose of emergency venous access when other attempts to gain access fail. Peripheral venous access can be extremely difficult due to vascular collapse from shock, vascular injury, obesity, or scars. Prepare the skin of the ankle with povidone-iodine or chlorhexidine, and drape the area. The vein is located 1 cm anterior and 1 cm superior to the medial malleolus. Infiltrate the skin over the intended cut with 0.5-1% lidocaine with or without epinephrine. Make a 2.5-cm full-thickness transverse skin incision over the site. Fee the vein from its bed for a length of 2 cm after it is located. 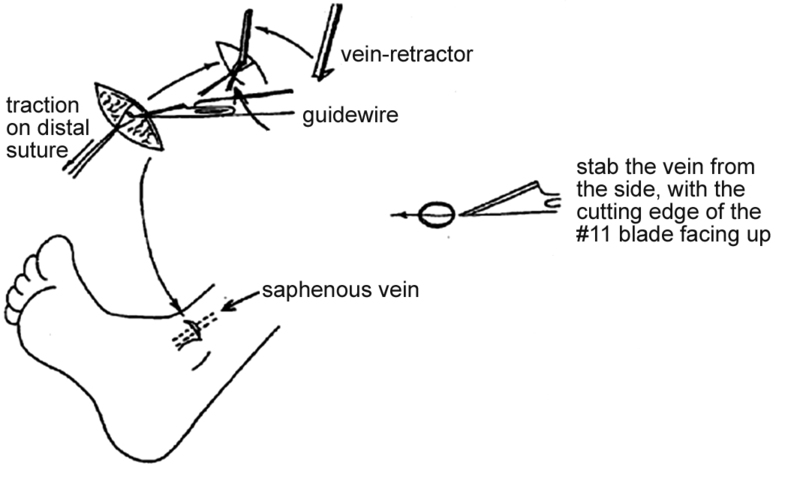 With the curved hemostat, pass the ties [thread] underneath the exposed vein proximally and distally. Ligate the distal exposed vein, and leave the free ends of the tie in place for traction. Give slight traction on the loose tie ends which have been left after tying the distal tie. This exposes the vessel from its bed. Perform a small transverse venotomy with a scalpel. Make a small incision, no more than 50% of the total diameter of the vessel. Some surgeons prefer nick in the line of the long axis of the vein. Introduce the plastic catheter/cannula through the venotomy opening, and secure it with the proximal tie. Attach intravenous (IV) tubing to the catheter. As an alternate measure, the tubing can be inserted directly into the venotomy site for more rapid flow rates. A bevel cut on the part being inserted helps in easier insertion. Close the incision with simple interrupted sutures. Apply sterile dressing.